Taking screenshots seems to be a quite simple and effortless task. Indeed, in theory you don’t need to download sophisticated software to successfully screenshot on Windows. However, basic tool that people use for that (Print Screen option) doesn’t support taking screenshots of a selected area. As a rule, one has to spend some additional time on editing the image to crop the excess and save a screenshot of a certain area. 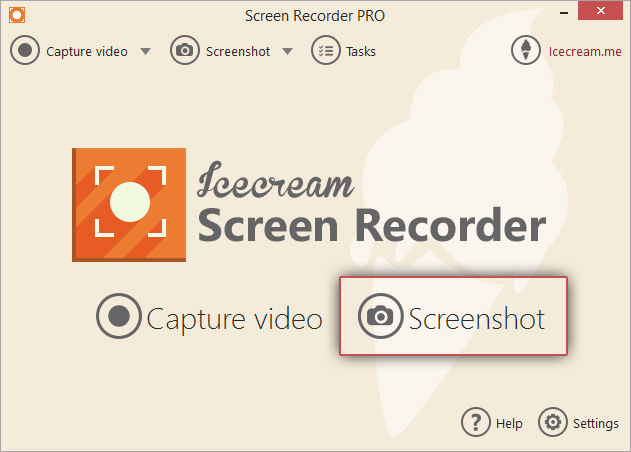 Icecream Screen Recorder lets you take a screenshot of selected area and thus skip the editing and cropping part of the process. 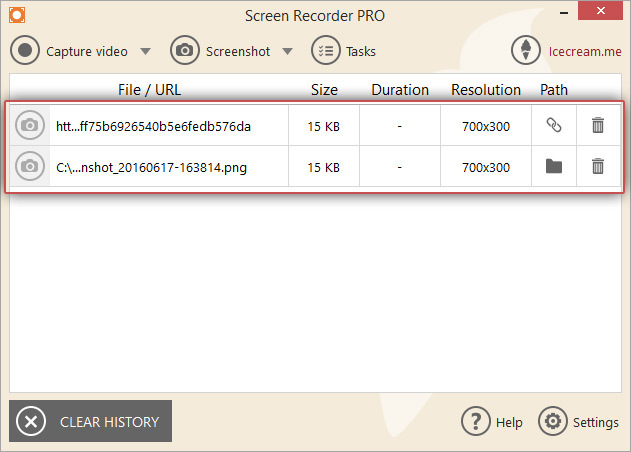 Download Icecream Screen Recorder to start working with the program. To do that, click the “Download” button and save the .exe file on your computer for posterior installation. Double click the file to run the setup and complete the installation by following Wizard’s instructions. On the completion, open the program and proceed to the settings. 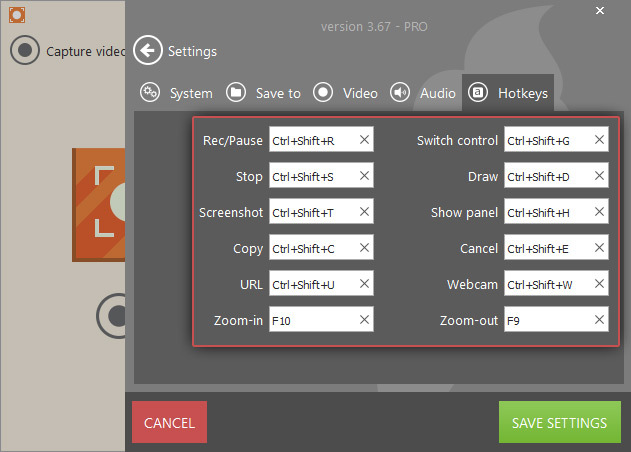 Press the “Settings” button in the bottom right corner of the main window of the screen recorder to open the Settings panel. 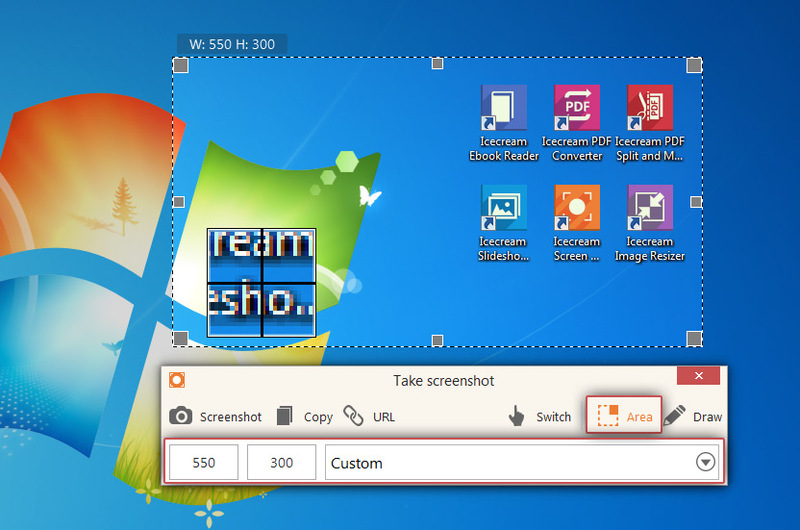 Start with the “System” tab, in which you may find the “Screenshot format” (PNG or JPG), “Show notifications” (enables the pop-up notifications by the program in the lower right-hand corner of the desktop) and “Area selection zoomer” (a zooming tool helping to place the screenshot area precisely) options. “Save to” tab offers you to select the destination folder of the screenshots created with the program (“Save screenshot to” option). In the “Hotkeys” tab you can get to know the current hotkey combinations and change them if needed. Such hotkeys as “Screenshot”, “Copy”, “URL” and other might be useful when you take a screenshot of selected area. 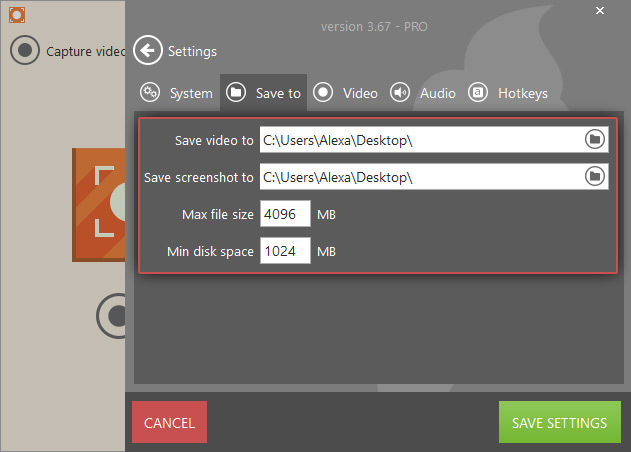 Сlick the “Screenshot” button in the center of the program's main window. Now, select the screenshot area by toggling the cursor over the desired section of your screen. If the area you’ve selected is not a perfect fit, use tiny grey markers on the frame to adjust it to the area you want to screenshot. You will see the width (W) and height (H) indicators in the upper left corner of the frame. 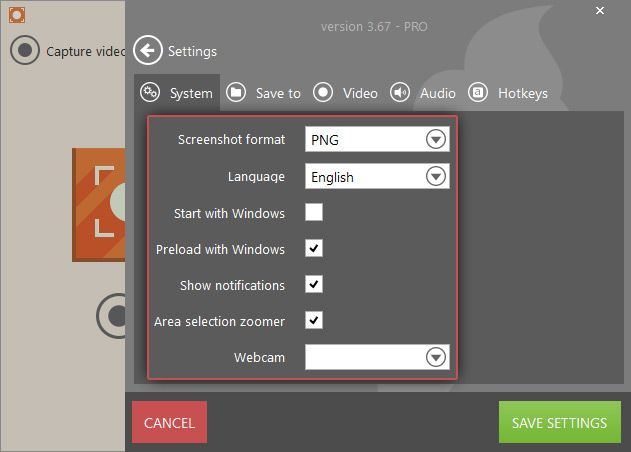 The program also supports such preset parameters as full screen, 960p, 720p, 1024x768p, 640x480p, 320x240p, 160x120p – they are available on the control panel that will be shown after the screenshot area selection Make sure the “Area” button is enabled on the screenshot panel while you are adjusting the screenshot area. Use the draw panel to comment on your screenshot and add graphics – simply click the “Draw” button and use brush, rectangle, oval, arrow tools and step tool. You may also select contour thickness and the color just as you do when using standard graphical editors. It’s possible to add some text to your screenshot as well – click the “T” icon, select the desired font size (from 8 to 34) and color, and click within the screenshot area where you want to type to add your text. To cancel the changes, use the “Undo” button at the right side of the control panel. The “Clear all” button located next to the “Undo” one will help you remove all the drawings and text from the screenshot. Screenshot. 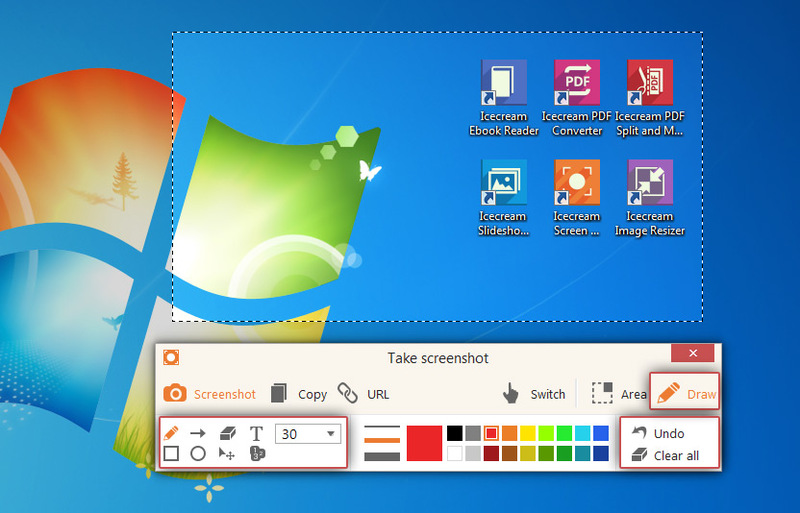 Clicking the “Screenshot” button in the upper left corner of the screenshot panel lets you take a screenshot of selected area and save it as PNG or JPG image on your computer. Copy. It’s also possible to save a screenshot to buffer and paste it wherever you want later. URL. This button helps you save a screenshot as a link that you can copy and share. It uploads your screenshot to Icecream Apps server by URL. All the links and screenshots are displayed in the chart in the History panel of the program. You can click the recycle bin icon on the right of a certain URL or image to delete it from the list or press the “CLEAR HISTORY” button in the bottom left to remove all the screenshots from the list.